A ship company based in New Jersey contacted us. They provide restoration dredging services, i.e. deepening ports for large ship access, maintaining such water channels, as well as creating barrier islands and land reclamations. They were in the middle of performing maintenance on a gearbox located on a shipping vessel specifically used for channel dredging, and after they inspected the 1,100 gallons of gear oil (ISO 320W) they had found that the gearbox was highly-contaminated with solids and moisture. After finding PFP, my contact at the company organized to send to us the contaminated oil in IBC totes so that we could filter it until reaching an acceptable target oil cleanliness level. This was a challenge for several reasons. First, the outside temperature outside was less than 50°F which turns 320-weight gear oil into the consistence of honey! For this reason, and to address the moisture contamination issue, we had to use a vacuum dehydrator with an on-board heater in order to heat the oil and thus 1. reduce the boiling point of the emulsified water 2. reduce the viscosity of the oil. This minimized the differential pressure going through the filter elements, which allowed the filters to last longer and maximize dirt load. In order to properly clean up the gear oil, we ended up having to first install a bag filter vessel in-line with the flow of the oil to the vacuum dehydrator, in order to use the dehydrator’s heater to warm up the gearbox oil as it was circulating. This was done initially without even touching the dehydrator’s filters because the particulate contamination level was so excessive that high-efficiency microglass filter cartridges would have been blinded off immediately. In order to avoid that, the bag filter vessel was incorporated as a “pre-filter” to the dehydrator. The vacuum pump on the dehydrator pulled the oil from the tote by producing vacuum through the bags and then suctioning it into the dehydrator. The oil then traveled through the discharge hose and back into the tote. Optimal temperature of the heated oil would have been around 150°F to 160°F, but we were unable to get it so high because the maximum temperature of the IBC totes was 140°F. Either way, with this setup, the bag filters removed a significant amount of the larger particles and protected our more expensive equipment as well. The gear oil in all four IBC totes had similar contamination levels, so I’ll just talk about the procedure and findings related to one of the totes (Tote A, to be precise). Once we circulated the oil several times and got it close to optimal temperature (140°F)we installed in the vacuum dehydrator housing a 12µ absolute-rated microglass filter cartridge, after which the baseline ISO 4406 cleanliness code was recorded. Even after multiple passes through the 1µ (nominal) bag filters and a single pass through the 12µ microglass filter the ISO 4406 code in Tote A was registered at 24/21/16 (click to view PDF of results). The worst of the four totes was registered at 25/25/22. After we hit the terminal differential pressure in the initial filter setup we replaced the 12µ microglass filter with a 6µ filter. We followed this step-down strategy with a 3µ filter and finally with a 1µ filter, and ultimately we achieved our ISO cleanliness goal of 18/16/13 (results, PDF). And with regards to the water contamination, as the oil was circulating through the particulate filters the vacuum dehydrator performed its dehydration job well, removing a percentage of the moisture contamination with each pass, until we reached our target goal of <500 PPM. We then used a laser particle counter in order to document the exact particulate contamination levels per the ISO 4406 cleanliness standard. We used a DOBLE moisture sensor to document the water contamination level in PPM. In the end, each tote required approximately 8 hours of filtration and on average a quantity of four to five pleated microglass filter cartridges (36″ long x 6″ OD) in the vacuum dehydrator. Ultimately we were successful in filtering the 1,100 gallons of 320W gear oil; we achieved the company’s target oil cleanliness levels required to ensure the continued operation and reliability of the ship’s gear gox. Do you have a question about oil purification or vacuum oil dehydration systems? Feel free to contact us anytime. Our friendly team of experts will be happy to help you out with your particular issue. A recent upgrade supplied by Precision Filtration Products to our newly installed centrifugal compressors, has greatly simplified our operation and eliminated unplanned shutdowns of these critical machines. Four very large multi stage, integrally geared Atlas Copco compressors were recently installed in a new natural gas processing plant. These compressors have a complex seal gas system and were originally supplied with a single filter. When the filters began to show increased differential pressure, the compressor had to be shut down to change the filter cartridge. While the manufacturer stated that the seal gas system could be shut down for a short period of time to change the filter, this posed the risk of damaging the extremely expensive and difficult to repair gas seals. In addition, the location of the filter housing made it very risky to change while running. I helped design a dual filter arrangement to solve their problem. Using the same filter housings as supplied by Atlas Copco, dual switching valves allowed one housing to be isolated & vented without interrupting flow to the compressor. This upgrade has allowed our customer to change the filters without any interruption to the process. It was relocated to an easily accessed location. A fifth compressor is under construction and will be upgrade prior to starting. 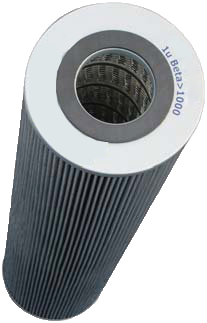 Please give us a call to discuss any of your filter needs or applications. We have a highly motivated and educated team to help you out and save you money! We received a call from a Unit Supervisor at an East Coast Refinery asking if we had a rental unit available to help clean up a 5000 gallon glycol tank located at the CCR unit. The glyol tank became contaminated with corrosion products as well as some bacterial growth, which can foul downstream equipment. He requested a complete system that included not only filters but hoses, pump and containment. By working with the service group at PFPUSA, we were able to put a complete system together for the customer and ship in less than 1 week. 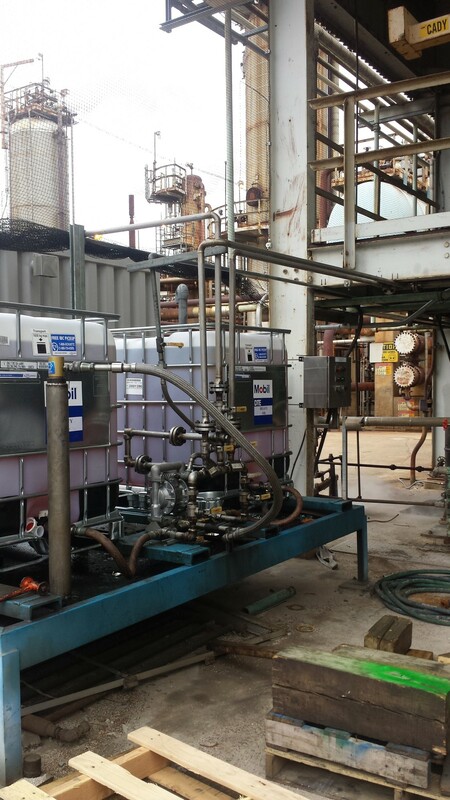 We provided the refinery one of our Single-Round Horizontal High Flow Filter Vessels, a pneumatic pump, and all of the peripheral hoses and valves required to connect to their glycol tank. The refinery started off with 40 micron filtration and gradually cleaned up the system by kidney looping and ended up with a final 5 micron level of filtration. The refinery is extremely happy with the results of the clean up and would call PFPUSA in the future to help with any additional problems at the refinery. An East Coast Refinery contacted me recently regarding a contaminated steam turbine lube oil reservoir. The reservoir was 85 gallons in size and had both particulate and water contamination leading to unscheduled maintenance and downtime of the turbine…ultimately costing time and money. Particulate and water contamination are a common problem that is addressed on a regular basis by Precision Filtration Products. We were confident we could provide them the proper solution in a timely manner, saving them time and money! After discussing the problem with our Engineering Team and given the size of the reservoir, we recommended using our Phoenix Membrane Purifier. The Phoenix was the perfect piece of equipment to remove both the particulate and water contamination from their reservoir. The Phoenix was installed and within 48 hours, the reservoir lube oil went from looking like orange juice to crystal clear. Our customer was extremely satisfied with the results. Please contact PFP to solve any lube and hydraulic contamination issues. One of our utility customers called in Friday afternoon with an emergency. They dumped a large amount of water into their 5000 gallon turbine lube oil reservoir and the turbine was down. We responded on-site within 24 hours with our crew and one of our rental 50 GPM vacuum dehydrators. In all honesty, we had never seen oil this saturated with moisture! And being that the customer asked for a turn around time of just 48 hours; our backs were against the wall. Our crew went to work and had the reservoir cycling within 5 hours of being on-site. In just 36 hours later, the oil was back on spec and the client was ready to start back up. Take a look at the before and after pictures attached. The results speak for themselves. Whether it’s oil, refined gas and fuels, air or water please keep Precision Filtration Products in mind for all of your critical process needs. Our 24 hour emergency services group will be ready and waiting to respond to your call. A refinery contacted us recently that required a filter system to transfer 55 gallon drums of ISO 100 oil to their storage tanks (see attached picture). They wanted to filter the oil prior to it entering the tanks. After getting more information on the application, we recommended using one of our Spin-On Filter Panels. We decided to utilize pneumatic pumps, instead of our standard 110 Volt electric driven pumps and motors, on the filter panels because the systems were going to be installed in hazardous areas, Class 1 Div 1 or 2. The pneumatic pumps are ideal for hazardous areas because they are powered by compressed air, making them intrinsically safe. 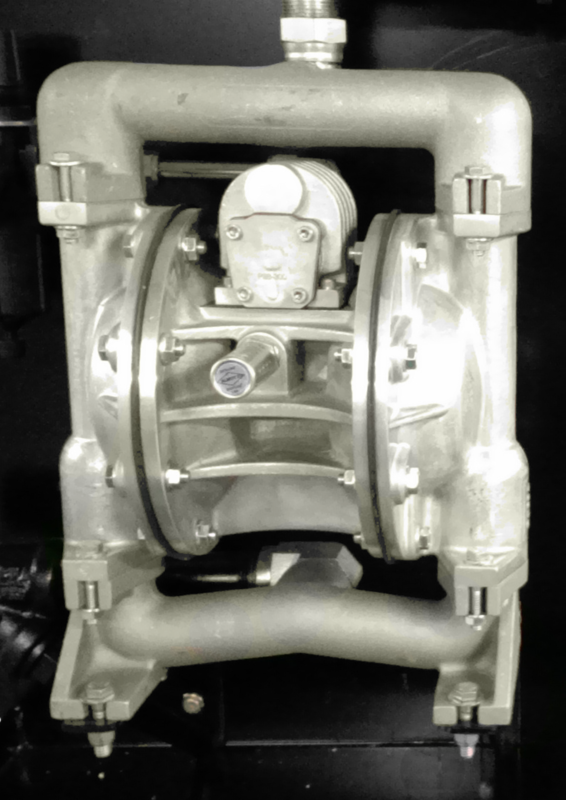 In addition to being intrinsically safe, the pneumatic pumps have many other advantages. They are self-priming allowing for high suction lift even at dry start-up conditions. They also have the ability to run dry without damage, which allows for weary-free operation, since there is no risk of damaging the internal components. We designed the Pneumatic SFP Filter Panel, aka “The Panimal”, using a Versa-Matic pump and also installed a ball valve as a kickback/relief so the operator can run the pump while controlling the fill rate remotely via a valve located at the equipment being filled. We utilized Viton® Seals throughout the system in combination with a 6 micron micro-glass ABSOLUTE rated Beta 1000 Spin-on Filter and a Water Absorbing Spin-on Filter to remove any free water that may be present. 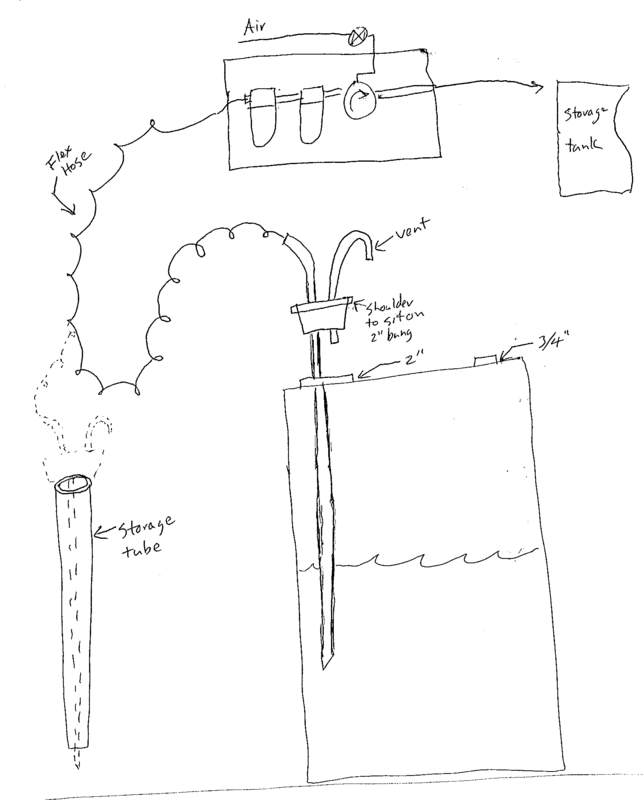 The customer also requested a drum adapter similar to the crude sketch they provided (see attached). 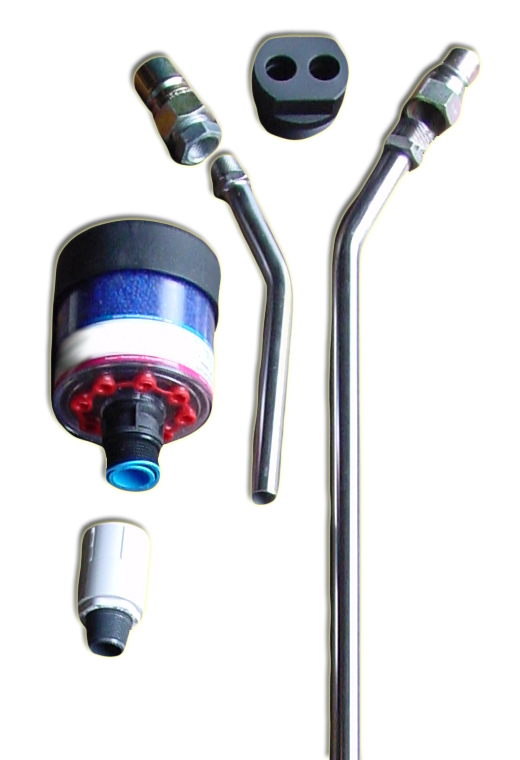 We ended up providing a recirculation adaptor kit that incorporates quick-disconnect fittings and a desiccant breather for the drum. This provides a sealed system to protect oil from external moisture and harmful particle contamination. It also allows them to recirculate the oil in the drum before transferring to the storage tanks or equipment, if necessary. The customer initially ordered (2) two “Panimals” for their facility. After using the Filter Panels for a short period of time, they had so much success, they decided to order (4) four additional systems. The refinery is now set up with Pneumatic Spin-On Filter Panels on all of their storage tanks. Call us for more information on our portable filtration systems for transferring oil from your drums to your storage tanks! We can customize the filtration systems to fit your needs. What is your current ISO Code? What is your target ISO Code? What is your reservoir capacity? What is the % of water ingression? What is the target moisture content? It turns out that their oil reservoir had a 500 gallon capacity and a high percentage of water ingression. After getting the answers we needed, we determined that we had the perfect size Vacuum Dehydrator in our Rental Fleet to meet their needs. We also equipped the dehydrator with a 6 micron Beta 1000 rated particulate element to help hit their target ISO Code. The customer placed the order and we were able to deliver and get the unit installed in less than 24-Hours. After installing the Vacuum Dehydrator, the paper mill saw an immediate reduction in both their water ingression and ISO Code. It worked so well, they have decided to continue to rent the dehydrator while they complete repairs to their cooler unit. Are you interested in learning more about maintaining your oil quality? Give us a call or check out or website, www.pfpusa.com, for more information on our Vacuum Dehydrators or other portable filtration equipment. We’ll be sure to help you improve your oil quality, and we’ll save you time and money in the process.